The cDNA coding sequence of Carassius auratus gibelio npy. The shaded boldface letters stand for the mature peptide. * Indicates the stop codon. Amino acid sequence alignment of NPY. 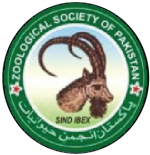 The shadowed regions are conserved in the listed peptides. * Indicates identical amino acids. 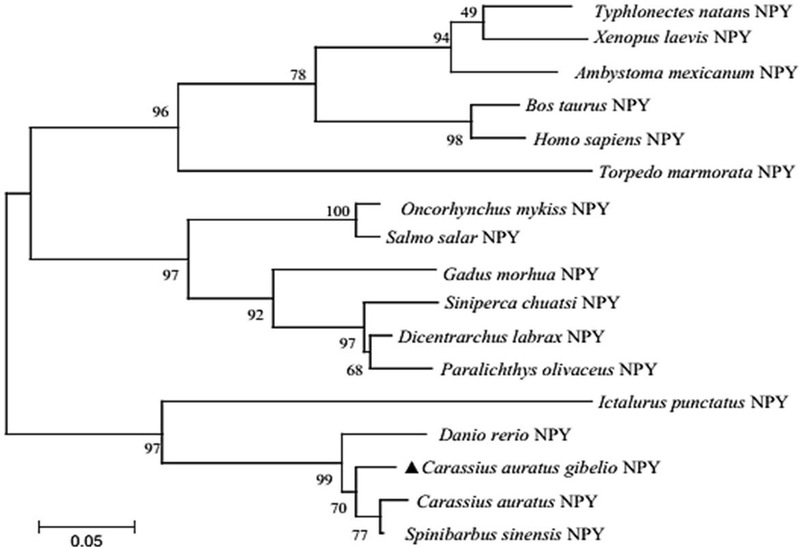 The phylogenetic tree of vertebrate NPY. Scale bar indicates the substitution rate per residue. Numbers at nodes indicate the bootstrap value, as percentages, obtained per 1000 replicates. 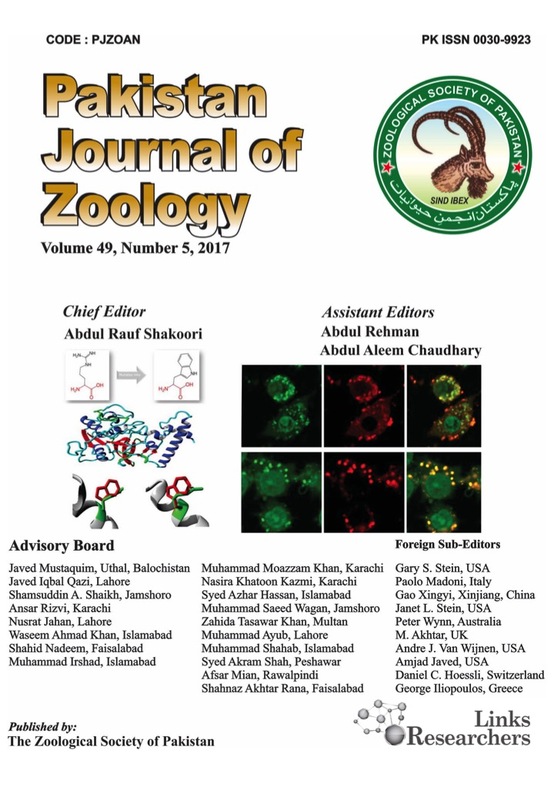 GenBank accession numbers: Typhlonectes natans (AAD48033), Xenopus laevis (NP_001081300), Ambystoma mexicanum (AAT66407), Bos taurus (AAR37328), Homo sapiens (AAA59944), Torpedo marmorata (AAA49281), Oncorhynchus mykiss (AAB25269), Salmo salar (BAH24101), Gadus morhua (AAX19943), Siniperca chuatsi (ABS83815), Dicentrarchus labrax (CAB64932), Paralichthys olivaceus (BAB62409), Ictalurus punctatus (AAF71617), Danio rerio (NP_571149), Carassius auratus (AAA49186), Spinibarbus sinensis (ABE73783). Relative expression of npy mRNA in tissues of gibel carp. Error bars represent standard error of the mean. Tep, telencephalon; Hyp, hypothalamus; Mep, mesencephalon; Ceb, cerebellum; Myp, myelencephalon; Pi, pituitary; Hk, head kidney; Tk, trunk kidney; Li, liver; Fg, foregut; Mg, midgut; Hg, hindgut; He, heart; Sp, spleen; Gi, gill; Te, testis; Ov, ovary. Re, red muscle; Wh, white muscle; Sk, skin; Ey, eye. 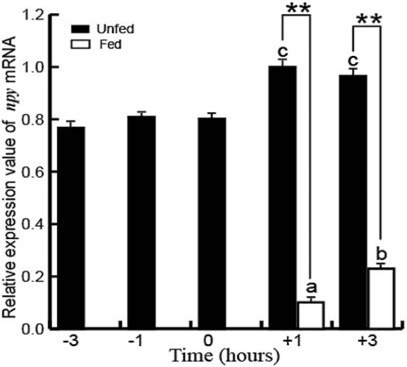 Postprandial changes in npy mRNA expression in the hypothalamus of gibel carp. The preprandial (-3, -1 and 0 h) and postprandial groups (+3 and +1 h) that differed significantly are indicated by different letters above the bars. Asterisks represent significant differences between the fed and unfed groups at the same time point. **P < 0.01. 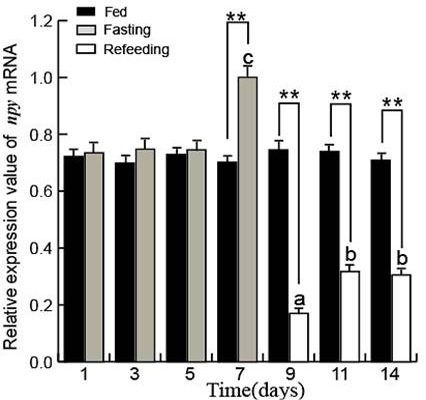 Effects of fasting and refeeding on npy mRNA expression in the hypothalamus of gibel carp. 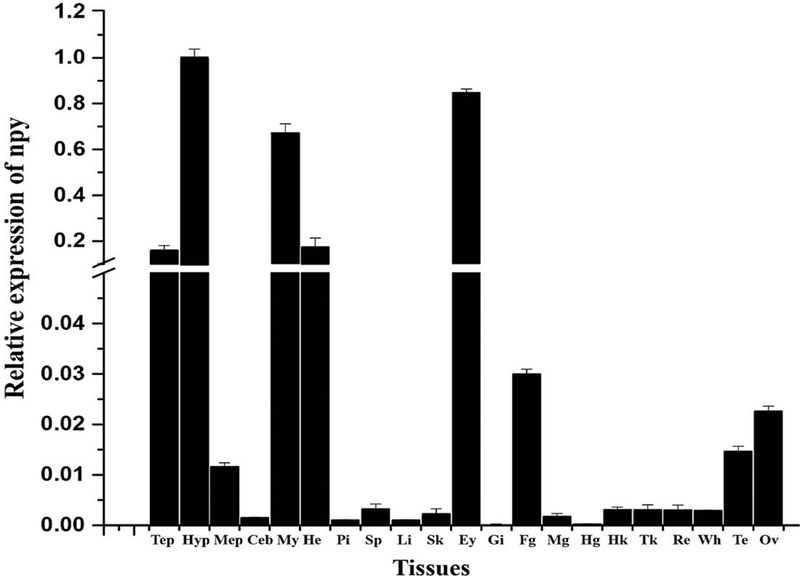 Bars with different letters represent significant differences between experimental groups. Asterisks represent significant differences between the groups at the same time point. **P < 0.01.